"Don't be ridiculous, Sergeant. That's big-time crime stuff." 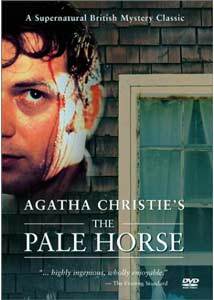 When you think Agatha Christie, the Kinks may not immediately come to mind for soundtrack music, but this is mid-'60s Christie, and things are groovy, baby�Austin Powers would be right at home in the world of The Pale Horse. This Christie novel seems to be something of an anomaly�no Hercule Poirot, no Miss Marple�and it's a far cry from her best work. But it makes for a passable entertainment, more fun for its trappings of time and place than for its plot. Mark Easterbrook (played by Colin Buchanan, seemingly the winner of a Ewan McGregor lookalike contest) is a sculptor, in that proverbial wrong place at the wrong time: just as he's returning to his motorcycle, in the same alley poor Father Gorman gets whacked on the head with a wrench, and killed. In the priest's hands is a list of names, all of whom are turning up dead under mysterious circumstances; the local authorities figure that the case is open and shut, that Easterbrook is their man. But since he's our hero, we know the lad is innocent, and he sets about trying to figure out just who it is that's doing dirt to the good citizens of the local parish. The movie is decked out with all kinds of great mystery clich�s�the country squire in a wheelchair with a plaid blanket over his legs; the inevitable good cop and bad cop; the pauncy art gallery owner; the inevitable femme fatale, Kate (Jayne Ashbourne), the necessary love interest for our man. (He ditches his impossibly wealthy sometime girlfriend, Hermia, to make time with Kate; Hermia lands on her feet with a stockbroker ready to keep her in the life to which she's become accustomed.) The title refers not just to the relevant Biblical passage, but to a house on the outskirts of town, inhabited by two dotty old sisters and their cook�comparisons are overtly made between them and the three witches of Macbeth, as the queer sisters like to cultivate their dark side. But this is Agatha Christie, not Anne Rice, so the territory isn't murky with tales of the hereafter; we're much more at home in the world of Colonel Mustard, in the conservatory, with the candlestick. The characterizations are wispy thin, but the film is undeniably entertaining; and as a special bonus, it features some smashing shots of huge, elegant English country houses. The movie is all plot, so describing any more pretty much gives away the store; it's not an especially ambitious project, but it has a certain charm. It was originally produced for British television, too, so it's got the fadeouts necessary for commercial breaks, or to hit the pause button and run out for another cup of tea. Image Transfer Review: A fair number of nicks and imperfections are evident on the print, detracting from the handsome photography of the exteriors especially. Some of the work here is solid, but the transfer seems like rather a slapdash job. Audio Transfer Review: It's a little tinny and thin, but the dialogue is entirely audible. Extras Review: An Agatha Christie biography and career overview are here, along with filmographies for Buchanan, Ashbourne, and Jean Marsh (who plays one of the three witches), and a weblink to the DVD's distributor, Lance Entertainment. Top-tier Dame Agatha on film would lead you to something like Murder on the Orient Express, but if you've run through many of the other offerings on the mystery shelf, this one is perfectly acceptable.